Can I use disperse dye in a small pot to dye a cold-water-wash polyester shirt? Message: Hi there I read your article on Disperse Dyes, and then the link from www.prochemical.com called “Immersion Dyeing Polyester” that you posted. I have a shirt that is 100% satin polyester, with nylon lace trim; the tag says wash in cold water on normal, and tumble dry on normal low heat. With this in mind, can I use a dispersion dying technique? Also, based off your article, I was just going to use dish soap to prepare the shirt rather than PRO dye activator. Is this ok? Also I am having trouble scaling down the measurements of ingredients. I am only planning on dyeing the one shirt which is quite small and do not have a pot that can hold 10L. If at all possible I would like the dye bath to be at most around 8 cups, because this is what my largest pot can hold, my current plan is to quarter the recipe. Thanks for all the information on your web site, it’s great! Several problems. One is that disperse dye simply CANNOT be used without high heat. Another is that there is no way that dish soap can substitute for dye activator. A third problem is that a very small dyebath cannot be used to make a solid color. A fourth is that I want to be sure you are buying disperse dyes, not another type of dyes. It is usually sufficient to prepare a shirt for dyeing by washing it with ordinary detergent in the hottest water it can tolerate. Washing with both soda ash (“PRO dye activator”) and detergent is a little more effective. You need to prewash to prepare the shirt because it may have invisible stains on it which will repel dye and produce light spots. Sometimes even washing is not sufficient, with clothing that was not sold specifically for dyeing, but it usually works, so most of us go ahead and take the risk. PRO dye activator is called for in the ProChem disperse dye recipe not only for prewashing the shirt, but also in the recipe itself to increase the pH of the dyebath to protect the color of the disperse dye. (It is not required in the Jacquard Products disperse dye recipe.) Dish soap will not work for this. Dish soap can be used as a substitute for another detergent, such as Synthrapol. The results may not be quite the same, but they will be fairly similar. Dish soap or other detergents cannot ever be used to substitute for PRO dye activator, which is sodium carbonate, also known as soda ash. There is no similarity between these two different types of products. If you wish, you can substitute washing soda, which is another form of sodium carbonate, though you should use approximately twice as much. If your shirt really needs to be protected from hot water, by washing only in cold water, then you can’t dye it with disperse dye. There are two ways to get disperse dye hot enough for it to penetrate the fiber in the polyester fabric. One is to BOIL it together with the fabric for at least half an hour. This means a full boil, not merely hot water. The other is to use the disperse dye as a transfer dye, by applying it to paper and then transferring it from the paper to the fabric by pressing with a hot iron. You also need to use a dye carrier chemical, such as PRO Dye Carrier NSC, if you want to achieve a dark, bright, or intense color on polyester. You cannot substitute anything else for the dye carrier chemical, except for another brand of polyester dye carrier chemical from another company that sells dyes. The dye carrier chemical is needed only for polyester, not for other synthetic fibers such as nylon or acrylic, and you can skip using it for polyester if you are dyeing only pale pastel colors. The dye carrier chemical is rather unpleasant; I have an outdoor burner so that I don’t have to use it inside my house. 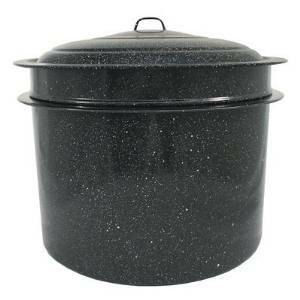 It probably doesn’t matter that you don’t already have a 10 liter pot, if you are thinking only of your cooking pots that you plan to use again for food preparation. Since you should not cook food in a pot that has been used for dyeing, you will probably need to buy another pot, anyway. Be sure not to choose an aluminum pot for dyeing, because aluminum reacts badly with both bases such as soda ash, and acids such as vinegar, and most dye recipes call for one or the other. A good dyeing pot should be either stainless steel or enamel-coated metal. 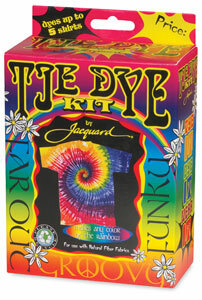 Even for a single shirt, you must not use a small dyeing pot, unless you want a variegated, tie-dye sort of effect. If you cram your shirt into a pot that is too small for the shirt to move freely in the water when you stir it, then you will get uneven coloration. The results can be beautiful, but not if what you really want is a single solid color. See my page “How to Do Low Water Immersion Dyeing“, to see what happens when you purposefully use too small a volume to allow the fabric to move freely. (The recipe described there is for dyeing cotton with fiber reactive dye, but you can get a similar effect by boiling your shirt with disperse dye in a small pot.) An 8-cup recipe will not work for dyeing a solid color, but it can work fine for a crystal LWI effect. The 10-liter dyebath recipe is for dyeing one pound of fiber. Weigh your shirt, while it is dry, on a kitchen or postal scale (if you have no other access to a small scale, you could try a vegetable scale at the grocery store). If it weighs half a pound, then, for a solid color, you can scale down to a 5 liter recipe, for which you will need at least an eight-quart pot. For a quarter-pound of dry shirt, you could use two and a half liters of water in a four-quart pot. If you’re going to be buying a pot specifically for dyeing, though, it would be good to invest in the larger pot, since it is more versatile. 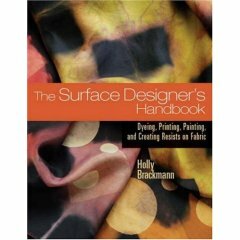 If you are not wanting to invest in a pot for dyeing, I think you should strongly consider the transfer dye method. It is not suitable at all for producing a single solid color, but it is wonderful for more complex effects, and it is very easy to do. It is less likely to damage your wash-in-cold-water-only shirt. If you want a repeating motif in your design, you can color a piece of paper in that design, iron it on, and then recolor it to use again. Even without recoloring, the paper can be ironed again for a somewhat paler impression from the first coloring. Since you’re in Canada, you may want to consider ordering your dyes from a Canadian source, rather than PRO Chemical & Dye in the US. 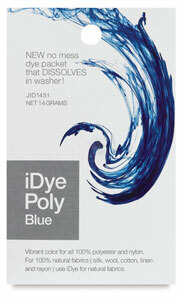 A good source in Canada is G&S Dye, in Toronto; they carry Jacquard brand iDye Poly, which includes the dye carrier chemical in a separate packet inside the package you buy. ProChem’s disperse dyes are less expensive in bulk, but Jacquard’s are less expensive for a single garment. For using the transfer method, you can mix your own disperse dye paint from dye purchased from ProChem, or buy special transfer crayons; Crayola brand Fabric Crayons, which look like ordinary wax crayons but are composed of disperse dye, instead, can be found locally in some stores in Canada, possibly in a fabric store or a crafts store. (See, for example, Crayola Fabric Crayons at Alco of Canada.) Unlike the ProChem disperse dyes, the Crayola disperse dye crayons mean that a garment should never be machine-dried, because the Crayola disperse dye is selected for transferring with less heat and might transfer to another garment in the same load in the dryer. This entry was posted in dyeing polyester on July 20, 2014 by pburch.